Do Homemade Equine Fly Sprays Really Work? Homemade fly sprays can be an effective alternative to manufactured fly repellents for your horse. The key to successfully using homemade fly sprays is in understanding how to properly use the spray. "You can't use fly spray (made with essential oils) once a day and expect it to work," Nan Martin, LSH, CRTS, founder of Experience-Essential-Oils.com said. "You need to spray it often." Flies annoy both horse and rider in the warmer months. Fly sprays are used by many horse owners to reduce the number of these pesky insects. Fly sprays made with essential oils will repel flies, not kill them on contact. "For a fly repellent to be truly effective, the horse needs to be properly coated in the spray. 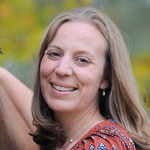 It needs to connect to the coat," Georgette Topakas, founder of Zephyr's Garden, LLC (a company that produces all-natural, herbal-based products for horses and dogs), explained. "I see so many chemical-based sprays basically shot into the air, missing half the body." While essential oils can be effective for repelling insects, mixing the oils with the proper base is imperative. "Plain water adds nothing to the effectiveness, so creating a liquid base that enhances the essential oils is important," Topakas said. She cautioned that working with essential oils requires research. "High levels can potentially cause burns and/or coat discolorations. Don't be afraid to use them, just do your due diligence before applying anything to your horse's body," she added. Using a fly spray made with essential oils is also environmentally-friendly and nontoxic. Some essential oils may offer additional benefits, as well. "Oils do more than deter flies," Martin noted. "Peppermint is good for concentration, too." Natural sprays have their limitations. "When customers ask if our spray repels all flies, I tell them no," Topakas said. "f you have biting flies the size of hummingbirds, I don't know of any natural product that can battle those pests. But if common black flies, gnats, no-see-ums, and mosquitoes are the problem, most natural products handle those readily." Before swapping synthetic fly spray for one made of essential oils, it is important to know that not all essential oils are the same quality. "Therapeutic grade oils are pure,"Martin said. "Perfume-quality essential oils usually contain 90-95% solvents, so their cost is a fraction of what it takes to distill pure grade oils." "Natural" fly sprays advertised for sale may not be all natural. "What really is 'natural' vs 'uses natural products'?" said Topakas. Horse owners need to be diligent and research the products that are advertised as natural. "Read labels; that's my best advice," she concluded. Horse owners can select from a wide variety of essential oils, as there are a number of them that contain insect-repelling qualities. "Many natural products contain Citronella, Lavender, Eucalyptus, Geranium, Neem, Peppermint, and Lemongrass, to name just a few," Topakas said. Though natural fly repellents may be costlier to purchase or produce at home, the added expense brings peace of mind to horse owners concerned about toxicity. What about homemade fly repellents for your horse? Horse owners are creative. An internet search will reveal a variety of homemade fly repellents using items such as vinegar, baby oil, dish soap, lemon juice, garlic, bacon grease, and more. "I have not personally taken the time to mix and use (any of the recipes), but other people think they work because they share them on our website," said Carolyn Twardowski with the Moniteau Saddle Club. Some horses may be sensitive to chemicals in both commercial and homemade fly spray products. When using these products, reactions such as rash, hives or discomfort may be an allergic reaction. Discontinue use immediately. One contributor on the Moniteau Saddle Club website wrote, "An elderly gent who had worked in the forests with horses told me to use bacon grease where flies like to bite the horses, base of ears, under jaw, etc. I’d been using petroleum jelly in all those areas and it lasts about three days, but he said the grease works better." Others have shared solutions that include a mixture of 1 cup vinegar, 1 cup baby oil, ¼ cup original Pinesol, 1 tablespoon dish soap, 1 tablespoon Skin So Soft, and 1 cup water. Before using homemade repellents with items other than natural oils, it is best to consult with a veterinarian to ensure the items in the mixture are safe for use on horses. 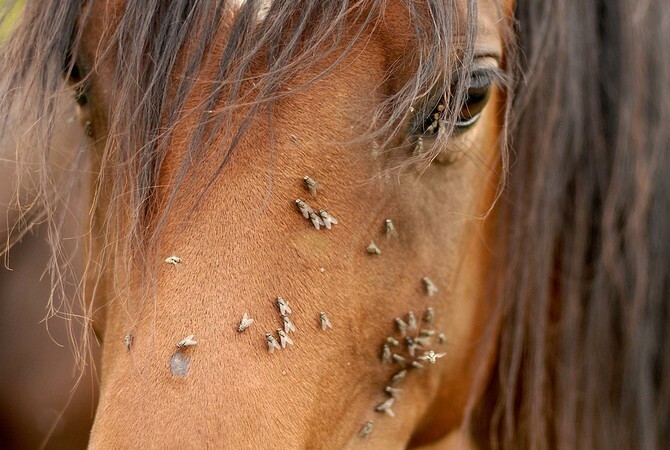 In addition to using common household ingredients to create a fly spray, some horse owners use internal fly repellants to keep biting insects at bay. Online suggestions include adding ¼ cup of apple cider vinegar to a horse's grain once a day or to add vinegar to their drinking water during the summer. Others have added fresh or powdered garlic to a horse's grain. While these additives can raise a horse's blood acid level enough to deter flies, it should be done carefully. Consult a veterinarian prior to adding garlic or vinegar to the horse's diet and monitor the horse closely to ensure he does not go off his feed or stop drinking water, which could lead to other complications, like impaction colic. 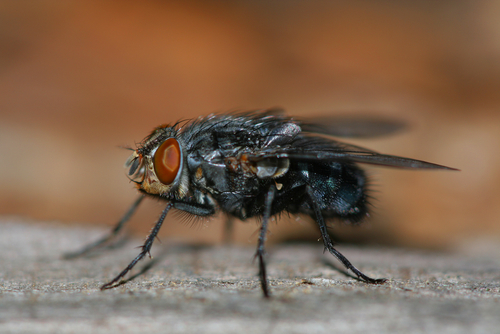 Considering your motivation for using homemade fly sprays will help you determine which option is the best fit for your barn. If your goal is to eliminate pesticides, products made with essential oils may be the solution for you. If your goal is to use commonly-found household items, other options could be the right choice. Whenever you start using a new product, closely monitor your horse for any reactions to the mixture used. Drop each of the oils into a 32 oz spray bottle and mix with water and begin spraying. "I have to tell you, I make each one a bit different because I like to experiment and I usually just throw them together at the barn," Martin said. "I usually put in about 5 to 10 drops of each oil. Again, play with them and have some fun. You can't go wrong with mixing your own homemade fly spray."